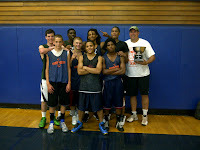 NH's most competitive high school basketball summer league is nearing the end of another successful season. It is all building up to the league's 'Tournament of Champions' which takes place on Friday, August 5 at Southern New Hampshire University. On Wednesday night it was the semi-finals and championship game for the league's Central Division. The 4 teams in action were Prospect Mountain, Trinity, Manchester Central and Merrimack. Here is the recap of all the action. Prospect Mt. (from Division III) continues to be the surprise team of the 2011 BST Summer League, as they were not only able to beat D-I Manchester Memorial on Monday night in the quarterfinals and D-I Trinity on Wednesday night in the semis, but they won both games going away. Trinity was missing their three big men (Silvere Aluko, Mabor Gabriel and Andrew Lauderdale), as well as sharpshooter Carmen Giampetruzzi. So this was definitely not exactly the Trinity team that will be taking the floor this winter. But it was still an impressive win for Prospect Mt. nonetheless, as the Timberwolves ran away with this one, 55-41 to advance to the Central Division Championship. 6'4" forward Jay Mousseau got things started for Prospect Mt. with a strong, athletic finish at the rim. Then 6'1" senior guard Zack Drouin made a nice steal and laid it in on the other hand for a 7-3 Timberwolves lead early on. Prospect Mt. led 9-5, but then Jake Hamel and Hunter Viscarello hit back-to-back three-pointers for Trinity, and the Pioneers took their first lead 11-9. Just like that the intensity on the court really picked up, and both teams were really getting after it on defense. 6'3" forward Austin Perrin then hit a three of his own from the right wing, and Prospect Mt. was back on top 14-11. With no big men inside for Trinity, Mousseau and Perrin took advantage, as they dominated the boards in this game. Perrin grabbed an offensive rebound, missed the put-back, then Mousseau got the rebound and laid it in. Then Drouin drilled a three from the top of the key on a well executed set play after receiving a pass from Perrin. That gave Prospect Mt. their largest lead of the game to that point, 19-13 with 6:02 left in the 1st half. Trinity head coach Dave Keefe was forced to call a timeout, and the Prospect Mt. players ran to the sidelines all pumped up and with smiles on their faces. The Timberwolves led 25-21 at the half, before Trinity freshman Ian Sistare made a nice drive and finish at the rim. It looked like Trinity might make a run and take control of the game, but Prospect Mt. was the hungrier team and they executed better. Drouin made a terrific drive and athletic finish by going by 2 defenders and laying it in with a reverse layup. Then he stepped outside and drained a three from the left wing to put his team up 36-32. Sistare continued to keep Trinity in the game, as he made another explosive drive to the basket for 2. The 6'2" guard finished with a team-high 21 points. That's when Prospect Mt. really took control of the game and put it out of reach. They were hitting on all cylinders, and Trinity was running out of gas. Just a few minutes later Prospect Mt. would take their largest lead of the game, 55-38 with just a minute left. Mousseau broke free inside for 2 which gave the Timberwolves a 46-36 lead, and they just kept the momentum rolling from there. Just like in their win on Monday night against Memorial, Prospect Mt. 's 4 best players (Drouin, Pat Cassidy, Mousseau and Perrin) were all just as good as anybody Trinity had. hose 4 guys for Prospect Mt. played the entire game except for the last 25 seconds. So depth could definitely be a problem for this team, as those 4 guys won't be able to play 32 minutes a game night in and night out during the regular season (they also won't be playing teams as good as Memorial, Trinity or Central during the regular season either). Even though this would have been a much different game if Aluko, Gabriel, Lauderdale and Giampetruzzi had been in there, you have to give credit to Prospect Mt. for the way they played. They played hard and they played as a team. First year head coach Tom Bourdeau has done a nice job with his team so far, and they definitely have the look of a top 5 team in D-III. Both teams were missing a lot of their key guys, but this was still a hard fought, entertaining basketball game. 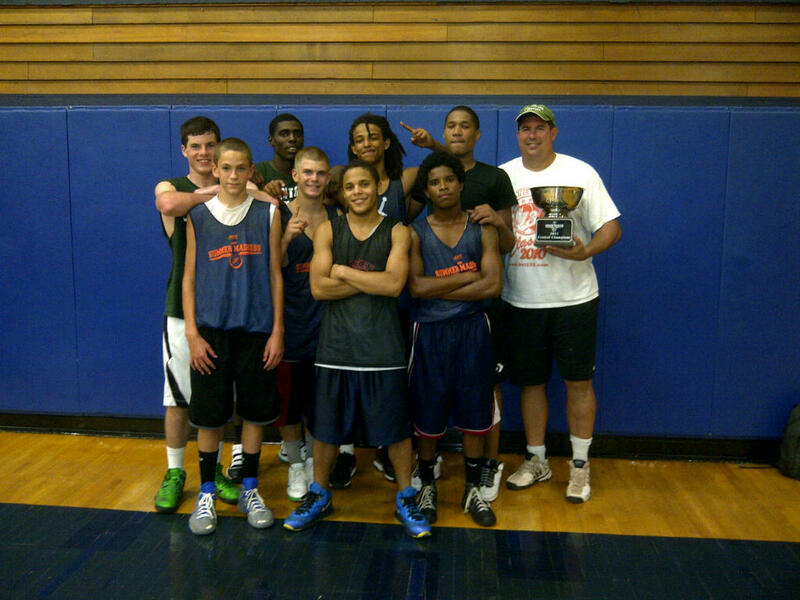 In the end though, Central was just too quick and they played better as a team than Merrimack, so they won it 45-40. Central was missing three projected starters in Gabe LaCount, Troy Pelletier and Dylan Lafond. If you watched this team play on Wednesday night they definitely did NOT look like a team playing without their best player and 3 starters. It is scary to think how good they will be when they have EVERYONE all playing together. Merrimack meanwhile was also playing shorthanded, as Tyler Gendron, Eric Gendron (broken wrist), Bryan Courtemanche and Kyle Richardson were all absent. That's Merrimack's 2 best players, and 4 of their top 6 players. So clearly this was not the Tomahawks squad that we will all see night in and night out this winter either. Merrimack actually took the early lead, as junior guard Brandon Malloch got things started with an offensive flurry. He was hitting shots from all over the floor. After he hit a three the Tomahawks went up 9-3. Central then came storming right back with an 11-1 run, to take a 14-10 lead. The key to the run was being able to speed the pace of the game up, force some turnovers and get easy baskets. Junior Brown and Stephen Gomez were both playing very well for the Little Green. Gomez made a nice steal and finish on the other end, then he led a 3-on-2 fast break where he made a nifty behind-the-back pass to Brown for the basket inside. Brown would then score a couple more times inside, including a slam dunk in transition. Isaiah Joseph (a transfer from Manchester West) would then score inside for 2, followed by a three-pointer by Gomez off the dribble penetration and dish by Brown. Just like that Central was up 21-10. Make no mistake, this is a VERY fast Little Green basketball team. They're quick and aggressive defensively, they get after it on the boards, they're deep and they can put points up on the board in a hurry. Malloch would hit another three to try and keep Merrimack in the game, as the Central lead was now 27-18. Central led 30-24 at halftime. Gomez opened the 2nd half with a terrific pass from the top of the key for a basket. Joseph was all over the place, making place, grabbing boards, hustling after loose balls and wreaking havoc on defense. Central then pushed their lead back up to 38-26. Once again Malloch answered back for the Tomahawks, as he refused to let the Tomahawks give up. he hit 2 more threes to cut the Central lead to 40-34. Brown would then make a nice post move and finish inside, as he continued to battle Merrimack senior forward Jared Peabody. Brown was Central's go-to-guy on offense, and Peabody is one of the best defenders in the state. They were matched up with each other early all game, and it was a fun match-up to watch. Central was able to hold on from there for the 45-40 win. Prospect Mountain was definitely the Cinderella story of this league, but in the championship game against Central, the glass slipper fell off. Depth was an issue for the Timberwolves. I mentioned in the recap of their game with Trinity how Prospect Mt. 's top 4 players played virtually the entire game. Well now these guys had to play 2 games in the span of just a few hours and it was obvious that they just ran out of gas. central is a deeper team and they're used to playing a fast and furious style of basketball so playing 2 games in a row didn't affect them as much. Central jumped out to a 17-0 run and didn't look back from there. They ended up winning this game 57-22 to capture their 2nd consecutive Central Division championship. Isaiah Joseph was once again very active on both ends of the floor for central. The long, athletic 6'2" forward is very quick, dominated inside and also stepped outside and knocked down the three. Junior Brown was playing like an all-state player in these games. Freshman guard Brett Hanson made a terrific pass in transition to Stephen Gomez for a layup, the Hanson also got inside for a couple baskets while Gomez was mahttp://www.blogger.com/img/blank.gifking plays all game and showing his superb quickness. After the game Central was awarded the Central Division Championship trophy and took pictures. Head coach Doc Wheeler, as expected, was very pleased with the way his team is playing right now. "We were missing some of our older guys, and we've got a lot of new kids that have transferred here" said Wheeler. "They're playing together as a group, they respect each other and they're working hard. It's been at least 3 or 4 years since I've had a team this fast." With the team they had out there on Wednesday night, plus, Lacount, Pelletier and Lafond, Central is as good as anybody in New Hampshire right now. Both Central and Prospect Mountain advance to the BST Summer League's 'Tournament of Champions' which will take place next Friday night at SNHU. The champion and runner-up of the league's Southern Division will also be there.